The first good visualization of shock waves — faster than the speed of sound — produced by a trombone, here. The visual is subtle (use the fullscreen view), but rest assured that the effect is great enough to explain at least part of the discomfort woodwind players may feel when seated directly before the low brass. A video chat, with physicist Geoffrey West of the Santa Fe Institute, Why Cities Keep Growing, Corporations and People Always Die, and Life Gets Faster. West's observed connections between growth rates and the mortality or open-ended growth of an entity, is fascinating and I strongly suspect that it might also apply to music and musical institutions. If we begin to see orchestras, opera houses, and conservatories as corporate in their growth and innovation patterns, then their inherent mortality as individual organisms ought to be better recognized and, indeed, seized upon as a structural opportunity for innovative alternatives to replace them, for the problem is not that the community around an institution can no longer sustain musical institutions or that music itself lacks in attractive, compelling and novel content, but that the institutions themselves are, through lack of innovation (i.e. programming, performance and presentation style) and unsustainable growth (particularly in bricks and mortar and administrative ballast) failing to sustain themselves. The present classical music landscape is, in many localities, dominated by old institutions which consume resources, and, because we have a tendency to lock in long-term public and private suuport to the older and bigger institutions (i.e. in Europe where opera employees have all the protections of civil service jobs) artificially slowing down paths towards bankruptcy, they may often temporarily crowd out of opportunities for innovative start-up firms. West: "...most companies start out probably with some of that buzz. But the data indicates that at about 50 employees to a hundred that buzz starts to stop. A company that was more multi dimensional, more evolved, becomes uni dimensional. It closes down. " That 50-100 number looks an awful lot like an orchestra which, coupled with the archaic nature of 19th century labor relations in an orchestra, says a lot about the ability of those free-lance early music and contemporary music groups to survive without comparable institutional support. Suppose we adopted a model in which the normative orchestras were organized around core memberships of ca. 25 players with core repertoires in 18th or late 20th/21st century repertoires, with 19th and early 20th century repertoire covered by combined groups at strategically opportune moments. Would that be a model sustainable until the next alternative emerges? Clarity, focus, classicism. Alvin began as a neo-classical composer. "I like my music clean, like gin." A reduction to essences, distractions eliminated, the original minimal impulse. Pulses, stutters, beats, swarms. Alvin was once a drummer, playing trap set in dance bands or drumming for the Yale Marching Band. Music for Solo Performer is the piece Ionisation ought to have been, composing directly for percussion ensemble without the mediation of fixed notation, specialized players, rehearsal. The composer listens: Bird and Person Dyning. Breaking down parameters: Pitches becoming rhythms becoming timbres becoming pitches again. Navigations for Strings, Septet. Subverting cause and effect: Music for Pure Waves, Bass Drums, and Acoustic Pendulums or — through a massive increase in physical scale, going far beyond simple classical effects to the non-linear, the chaotic and catastrophic — Music on a Long Thin Wire. Sounds articulating spaces: "I'm not interested in expression, but I am interested in expressivity." Music as a means of finding ones way in the dark (Vespers). Music made from sounds made visible (The Queen of the South) or the outline of a landscape translated into tones (Panorama.) A voice articulates a space (I am sitting in a room) with all its expressive and individual physical and autobiographical attachments erased in the process, so that the expressivity of the room itself is revealed; or, in The Re-Orchestration of the Opera "Benvenuto Cellini" by Hector Berlioz audaciously using the space in which the voice is produced to transform the timbres of a work by the greatest orchestrator. Object lessons: Chambers. W.C. Williams: No ideas but in things. Realizations of Chambers tend to one of two extremes: either the most perfect acoustic match between object and sound source or the most perfect, if frequently surreal poetic match, i.e. the sound of the Cologne Hauptbahnhof coming from a thimble (the ideal, one supposes, would be: tempest, teapot). Risk everything: A fundamental commitment to the experimental music project. Risk failure, risk nothing happening, and try again'n'again to find the optimal means for a phenomena to happen, to express itself, as music. Allow the phenomena to determine the form. Robert Irwin: "Ever Present, Never Twice the Same. Ever Changing, Never Less than Whole." Composing is often a letting-go of the composer's monopoly over composition. And too: choral conductor, actor of underground legend (Dr Chicago), rider of bicycles, patient fly fisherman, reliable and generous cook of pasta for tired dancers (and impoverished young scholars). 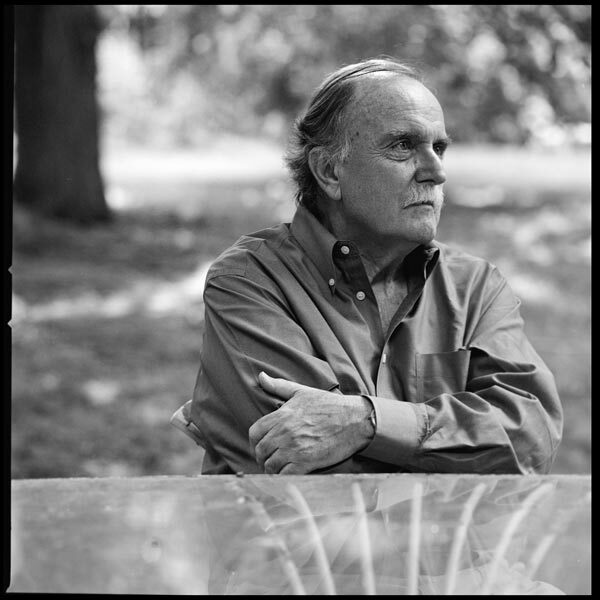 I am honored to have been — and still be — Alvin Lucier's student, for his challenges, his clarifications, his purposefulness, his directness and humor. Some teachers of composition try to give you everything, you belong to their "school"; Alvin instead gave polish, to help you be better at what you do, not be second best at what he does, and he gave posture, to help stand up for your work. A true story: In Berlin, many years ago, with an evening off in-between concerts and Alvin's wife and daughter, Wendy and Amanda, already flown back to Connecticut, Alvin and I ended up in the opera. Arabella, of all things. Not exactly what you'd expect the composer of I am sitting in a room to be watching. A traditional production, with plenty of old-fashioned stage magic, with Lucia Popp and Julie Kaufman as the two sisters. The curtain came up on the second act and it starts snowing on stage — I told you, it was old-fashioned stage magic — and Alvin jabs me with his elbow and says, just loud enough for everyone within a three or four meter radius to hear: "Look at that snow... have you ever seen anything like that? Isn't that terrific?" No, I hadn't, and yes, it really was terrific. Aren't the obbligati for bassett clarinet (in Parto, parto, ma tu, ben mio) and bassett horn (Non più di fiori) in La Clemenza di Tito just about the greatest things in the world? "If I were only in it for the money, I think I'd hook myself up with one of those gigs on the fast-growing and lucrative death-of-classical-music circuit, jaunting off to foundations and conservatories and sunny island conventions and well-catered, bubbly-lubricated board meetings, lecturing and consulting and prognosticating and doing the shake-down rounds in hotel bars, just me and my expense account doing our very best to help drain those rapidly-depleting coffers that otherwise be spent on, well, music." So, it's the work that counts, not the catalog, but I'll readily admit to my regular lapses into completism, which seems to happen whenever someone's track record has simply been so good that his or her name becomes a track record. So I eagerly wait for each and every new work I can hear by Jo Kondo or Richard Ayres, for two examples of composers with reliably astonishing craft, style, and ideas. Sometimes a composer gets around my completist barrier simply by virtue of having a small catalog: complete sets of sheet music for Machaut and Ockeghem (those three volumes of endlessly variegated lines were one of the best birthday presents I ever gave myself!) and Ruggles, Varese, and Webern take up only modest shelf space, and they've all been resident, complete as I could get them, in my shelves for decades. Some composers' work have become scattered and obscured with time, so a certain collector's mentality takes over, gathering each scrap of Richard Maxfield or Terry Jennings that I can scavenge. A good portion of Harry Partch's music, so important to me earlier on, sits, copied-out in a transcription style of my own, from days when I couldn't afford quarters for the photocopier. Other composers are models or teachers or good friends, and the urge to have their works with me is equal to the urge to spend time in their company: Leedy, Mumma, Lucier, Young. But there are also larger catalogs for which having everything would strike me as an entirely reasonable proposition: Mozart, Berlioz, Ives, Cage, perhaps Feldman or Christian Wolff.